The Flash Season 5 Episode 17 Recap: "Time Bomb"
“Secrets are like walls. 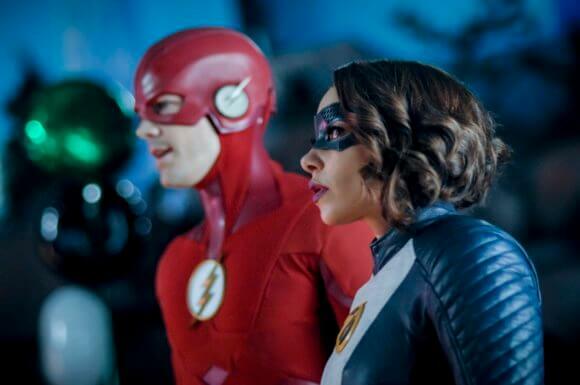 You can’t really know someone with walls between you,” says Barry (Grant Gustin) to Nora (Jessica Parker Kennedy) explaining why it’s important for a metahuman wife and mother to tell her family about her powers in The CW series The Flash season five episode 17. Nora becomes even more upset, demanding his help. “There’s only one thing left to do: tell your father. You tell your father everything,” suggests Thawne. Orlin Dwyer (Chris Klein) wakes up in a remote cabin and finds his adult niece Grace (Sarah Carter) watching over him. She reveals her identity and that she’s come from the future to find him and continue his mission. Dwyer asks what mission and she says killing every metahuman. Grace leaves, informing him there’s something important she has to do. When she gets back they’ll find a way to get his powers back. Joe (Jesse L. Martin) and Barry question Dr. Ambres’ co-workers but fail to come up with any leads. Joe decides to return to the precinct while Barry heads to S.T.A.R. Labs. And speaking of S.T.A.R. Labs, Sherloque finally breaks Nora’s code using the computers and can see she’s indeed working with someone. However, she never names him in her journal. Grace (aka Cicada II) breaks into the CCPD cold cases file room. She kills the cop in the room and steals one file. Back at S.T.A.R. Labs an alarm goes off and Cisco (Carlos Valdes) and Ralph (Hartley Sawyer) investigate the STAR archives to see if anything has been stolen. Barry and Nora also look for anything out of place and find Thawne’s time sphere in the woods, which is also still at the S.T.A.R archives. How is this possible? Simple. They realize Cicada II is grown up Grace from the future. Joe and Barry are called to the crime scene at CCPD and Barry uses his super speed to confirm only one file is missing. They figure out it’s the file on Grace’s parents’ death. Cisco’s on a date with Kamilla Hwang (Victoria Park) when Ralph barges in. Kamilla leaves and Ralph asks when Cisco’s going to bring her around to S.T.A.R. Labs and meet everyone. An annoyed Cisco blows off Ralph who tells then informs him Barry needs him. Sherloque investigates the time sphere and Iris (Candice Patton) interrupts to ask what he’s doing. He doesn’t give any details but says he’s trying to figure out the mystery of Cicada II. Iris is suspicious and doesn’t like Sherloque investigating on his own. Barry and Nora ask Cisco to Vibe the ATM where Grace’s parents died due to an explosion. Cisco sees a hooded woman who just before Grace’s parents arrived at the ATM tried to use it only to set off sparks. She quickly left. Team Flash identify the woman as Vickie Bolen (Catherine Lough Haggquist). Grace returns to the cabin and is upset the police never really investigated her parents’ murder. Dwyer asks her what she’s doing, and she reveals she’s going to finish what he started and kill every meta – starting with the one who killed her parents. Joe, Barry, and Nora talk to Vickie who’s hosting a kid’s birthday party with her husband. Vickie, out of her husband’s earshot, admits to the ATM explosion but says she quickly got out of there. She was scared because her powers caused it and sent the money flying everywhere. She wasn’t aware anyone had died. Joe and Barry realize Vickie has kept having powers a secret from her family. Barry tries to convince her she should tell them, but she (justifiably) says he should mind his own business. Vickie returns to the party and Nora senses Cicada II. Barry suits up and acts as though he’s a cosplayer hired for the party, leading the kids away from danger. Nora tries to get to Vicki but Cicada II shows up and blasts XS with her dagger dark matter powers. Vicki uses her power to make a soccer ball a sonic ball and hits Cicada II with it. Nora then speeds Vicki away, and Barry returns to rescue Vicki’s husband and daughter, who was also hit by the blast because she was too close to her mom, to safety. Ralph sends for Cisco who shows up thinking something’s wrong. It’s not, actually. Instead Ralph has good news to share: Iris is hiring Kamilla to do some photography for her paper. Cisco’s extremely angry with Ralph but puts on a happy face when Kamilla appears. He suggests they go celebrate her new job. Back At S.T.A.R. Labs, Sherloque investigates Thawne’s old wheelchair and finds a computer drive hidden in it. At the hospital, Vickie’s daughter’s now afraid of her mom because of her powers and her husband warns her to get away from them. Joe intervenes and takes the husband for a walk to cool off. Nora sees how the discovery of Vickie’s secret is hurting her family and it fills her with fear about telling Barry the truth about Thawne. Ralph checks in with Cisco who tells Ralph that when he’s with Kamilla he feels normal. He doesn’t want to ruin his relationship by bringing her into Team Flash and what he really does too soon. Ralph understands but asks how long he thinks he can keep the two worlds apart. Grace returns to the cabin upset about letting Vickie get away. Dwyer thinks it’s a good thing because he read the file and her parents’ death were an accident. Grace becomes upset, telling her uncle he sounds “like them.” Dwyer sees Grace’s wound on her forehead and says they need to see Dr. Ambres so she can help her. Grace, unremorseful, reveals she killed Ambres. Surprised, Dwyer asks why and Grace says because she betrayed him and took away his powers. At S.T.A.R. Labs, Sherloque goes into the Time Vault and activates Gideon to use the computer drive. It’s a video file of Thawne talking science and DNA, and Sherloque asks Gideon to run handwriting analysis on the writing in the video of Thawne to some of the writing in Nora’s journal. Bingo – it’s a match! Sherloque now knows Nora has been working with Thawne. Back at the hospital, Nora overhears Vickie explain to her daughter why she never told her about her powers and sees the two getting close again. Cicada II shows up and throws one of her power daggers. Nora suits up and as XS speeds Vickie around Central City with the dagger following them. The Flash goes out and tries to talk Cicada II down but she uses her powers to pin poor Flash to the ground. Vibe and Ralph show up and make a breach for XS to escape through with Vickie. The dagger hovers above where the breach used to be. Cicada II is about to kill The Flash when Dwyer calls to her, telling her to stop. He realizes all the hate she has toward metas came from hearing him talk to her when she was in the coma as a little girl. Dwyer admits he was wrong and that she doesn’t have to go down the same path he did. He tells her to let her anger go. At S.T.A.R. Labs, Team Flash is still in shock over Grace killing her own uncle. Caitlin (Danielle Panabaker) tells the team she ran some tests while she was at the Tannhouser sit. Grace’s power allows her to control the dark matter in other metas. She also says that Nora and Grace seem to be psychically connected. 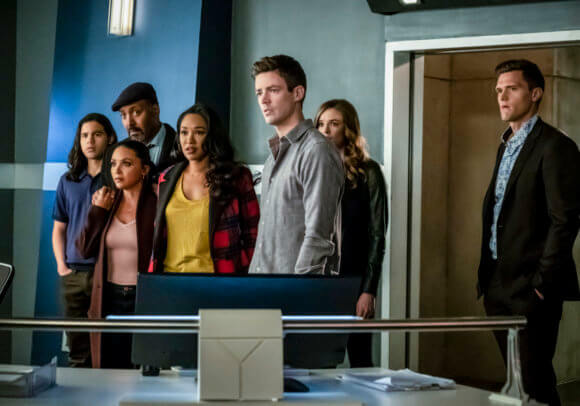 Ralph suggests everyone go get a drink, but when Team Flash starts to head out Cecille (Danielle Nicolet) senses Nora wants to tell them something. Nora looks upset and before she can say anything Sherloque takes over the conversation. He says Nora wants to tell them her secret and Nora freezes. Sherloque says Nora doesn’t know where to begin because her secret threatens everyone around her. “Stop it,” hisses Nora. Sherloque says he’ll start at the beginning and tells Team Flash that when Nora first time-traveled, she was extremely careful. But then she changed and inserted herself into the action by helping Barry destroy the Thinkers satellite. He knows it wasn’t her idea. Team Flash stare at Nora and Sherloque. “Please stop,” whispers Nora but Sherloque continues, revealing someone told her to do it and that same someone’s writing is in her journal. “The person who wrote ‘Timeline is Malleable’”, the same person who seeks to alter the timeline to suit his own purpose…Eobard Thawne, The Reverse Flash…your teacher,” reveals Sherloque to a stunned and hurt Team Flash. Iris asks Nora to tell them it’s not true but she just looks at them. “She can’t, because it is true,” says Barry with tears beginning to form in his eyes. Nora starts to say she wanted to tell them and Barry speeds her into the pipeline. Barry, looking disgusted with Nora, turns and begins to leaveas Nora calls to him. “I’m sorry I lied to you,” yells Nora. Barry turns and with a cold and emotionless expression says, “So am I”. With Nora’s secret finally revealed, an even deadlier Cicada on the loose, and Eobard Thawne once again a possible threat, Team Flash has more at stake than ever.